The images would have seemed fairly dull at the time. I suspect that they were part of an Art School photographic or graphic design project. ‘Go and study the new shopping precinct at Churchill Square’, that sort of thing. Of course they are not dull now because of the passage of time, their quotidian nature makes them very interesting not from an aesthetic point of view but from an archaeological one. I guess that they were taken in 1968 or 1969, when the surroundings were new. Clues to the date are visible, in a television shop window; ‘colour’ is announced as on the way. Wow, great photos; thanks for posting! I left Brighton in 1990, but I seem to remember that Tesco was in the lower level of Churchill Square, and WH Smiths at the front of the shopping centre, but the second photo suggests otherwise. Is it me goofing, or did the two shops move location at some point? In my humble opinion, after spending a day in Brighton last year, the old Churchill Square was better than it’s new version! Unfortunately we moved from Brighton in 1964 and missing the place to this day, and as an aside, happen now to live near to a field that is the furthest from coastal waters in Britain. My main comment is that I was glad in one way not to be living where I would see the ugly site of Churchill Square which replaced some of the most attractive little streets and houses in the centre of town, such as Clarence Street, Granville Place, part of Russell Street, Cannon Street, Artillery Street and Little Russell Street. Just have a look at the old street maps, torn down to make way for the concrete ugly building. All done in the name of progress. I posted a reply to this the other day at the same time as to the other featured article. The other has appeared, but this one got lost on the way somewhere. It is East Street, looking towards the Town Hall in Bartholomews. Tescos was on 2 levels. Photo 1: The first one is of East Street opposite the entrance to Regent Arcade. 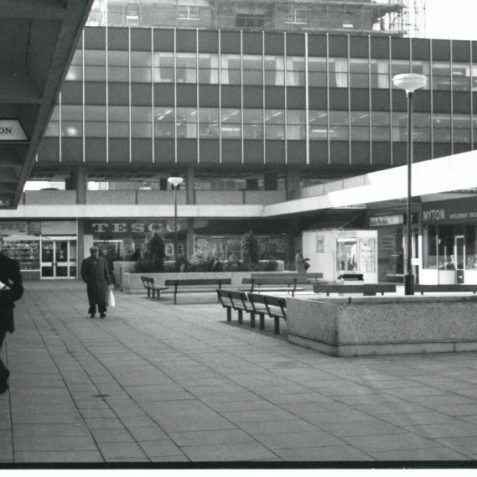 ( East Street entrance ) Photo 2: Unmistakeable old Churchill Hill Square. Photo 3: Inside old Regent Arcade looking down towards the East Street entrance. Photo 4: Can’t be 100% sure but looks like looking up from East Street entrance. This is East Street with the Town Hall in the background. Hi Kenneth, I too am confused. 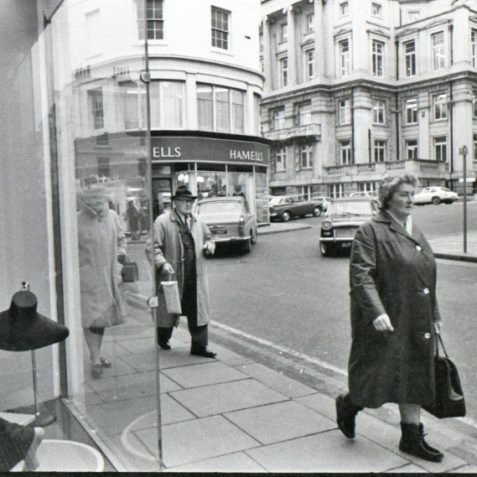 From 1969 till 1975 I worked at Miss Selfridge which was next door to Smiths. I too thought this was the lower floor of the precinct but I am certain both Smiths and Miss Selfridge only had exit doors on the main floor level. I went swinging through them at top speed regularly enough at lunch and tea breaks collecting shopping etc. I joined Miss Selfridge as it opened its doors with a staff of about 20. The Bistro downstairs was still being built as were the staff toilets in the basement. But it was a wonderful place covering 3 floors then and pumping out Beatles and Elton music all the day long. On this side of Smiths was the chemist. I don’t remember Tesco standing there and where is British Home Stores? That is a large store and would be on the other end of this picture. I hope someone will join in this quest to help square things up a bit. Great photos. Does anyone remember the awful tower ‘statue’ at the rear (I think) of Churchill Square? It was just a tall column of concrete and flint or pebbles I think – yuk! I lived in Blucher Place until 1957 but my grandmother was the last person to move out in 1960. Her house was compulsory purchased by the council; originally they offered £600, but the tribunal agreed £900 compensation. Her name was Edith Taylor, and she can be seen standing by her house on James Gray Collection Vol 29 number 106. The statue referred to was an absolute monstrosity ! Tesco’s was on 2 levels, the lower was the main store, however on the upper level they had a ‘Home and DIY’ section. I think the photo is the side of Churchill Square looking towards the rear. Actually I’m pretty sure, in fact positive, that WHS had 3 entrances; the front, the rear and a small side entrance which I think is the one in the photo. The front and rear entrance were onto the main store, the side entrance was by the stairs that went up to the ‘travel agent’ part (I think I’m correct), also stairs went down to the small underground record section that was alway incredibly hot. This is the upper part of Churchill Square, showing the side entrance of Smiths. Beyond, is the large chemist’s on the corner. Opposite the chemist’s, at some point, was Mothercare. To the right of where the photographer is standing, is the Prince of Wales pub. Bhs is to the left, round the corner and along from the chemist’s, next to the back end of Smiths and Miss Selfridge. This is Regent Archade looking towards East Street. My father had an antiquities shop just to the right in the 1980s. 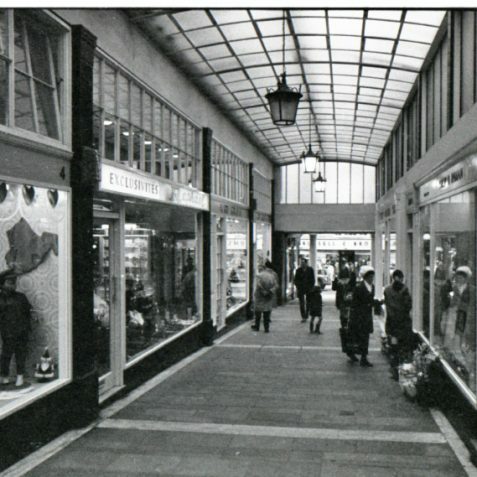 This is Regent Arcade looking towards Market Street just behind the Sussex pub. I remember the TV shop in Regent’s Arcade (near East Steet), as although I never went inside I can recall people six deep trying to get a glimpse of the World Cup Final in 1966, through the window. 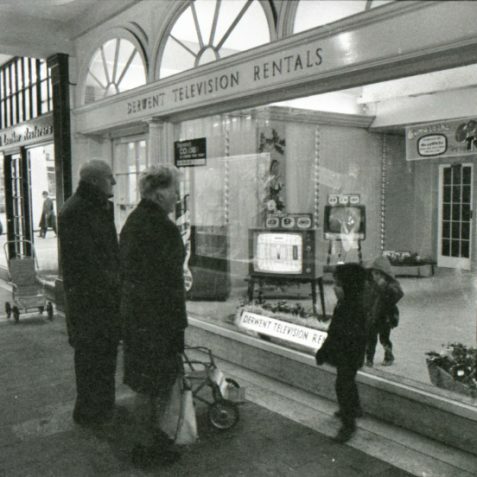 That was an afternoon when you could get some shopping done, as virtually everyone was glued to a television! 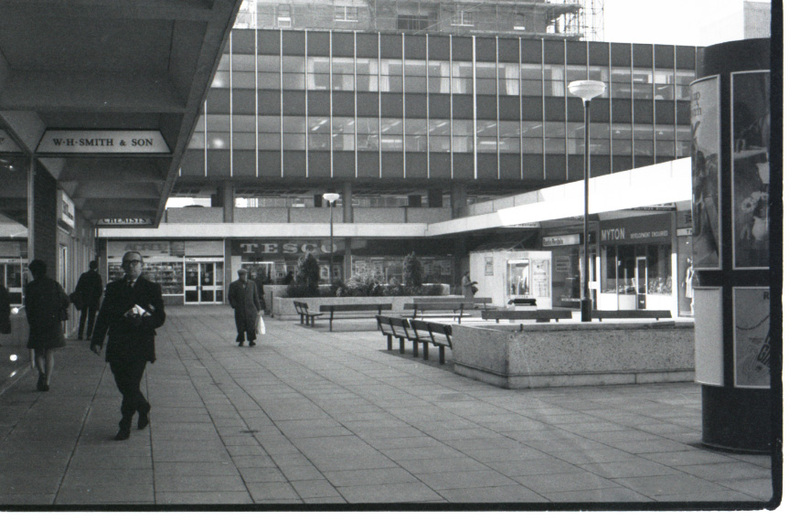 In the early 1970s there was a card shop and vegetarian cafe on the lower level of Churchill Square. The cafe had tables and chairs outside during the summer months. Tesco was at the rear of the square with Telecom offices above. You can just see roofs of parked cars above the Tesco sign. The wall to the right of the man with a white bag was where steps went down to the lower level. I think BHS is not in the photo as it would be behind the taker. The ramp to the car park is still there now just across from the Prince of Wales pub as today you could walk though BHS to the rear of the square where a tall monument was also a kiosk sweet shop. One side had possibly a Sainsburys and Bejams frozen food shop at the rear then Tesco took up the rear right hand side of the square. Sorry Peter, but your memory is faulty. The main Tescos store was at ground floor level with the “Home & Wear” section downstairs. I remember this well because I worked as a “Saturday boy” at the store in 1971/2. My job was to collect the used baskets from the tills and return them to the entrance, as well as rounding up trolleys from around Churchill Square, the underground car park etc. On my final Saturday one of the assistant managers told me to make my way along a narrow ledge above the escalator down to Home and Wear, with a cloth and bucket of water, and wash down the wall above the escalator. I refused, since it was a 15 foot drop if I slipped, and I was sacked on the spot. The following Saturday I started working at Sainsburys in London Road (until I was sacked for refusing to get my hair cut). No Health & Safety at Work Act in those days. I worked at Sainsburys in Churchill Square from 1968. It was brand new and I was in the store two weeks before opening as part of the team filling it up; it was daunting and felt early on as though we were filling an aircraft hangar, it was certainly big enough. We also had to collect trolleys each day but on Saturdays we had to count up and no-one in the management team was allowed home until they were all accounted for! (Why DID we do it?) Considering they had tiny wheels they travelled vast distances. Many a time we found them as far as Norfolk Square and Brighton Station. On one occasion we were phoned from Hurstpierpoint to say they had a JS trolley in the garden! Churchill Square was a windswept grim ‘Brutalist’ architecture place and no-one was sorry to see it go. How was it considered attractive and allowed to be built, especially as it replaced the lovely Grenville Place? The ‘Health Food’ restaurant below at Churchill Square was called ‘Slims’. Not sure if it was vegetarian, but certainly a ‘health food restaurant’ ahead of its time really. The scaffolding on Chartwell Court gives it away! This brings back a lot of memories. 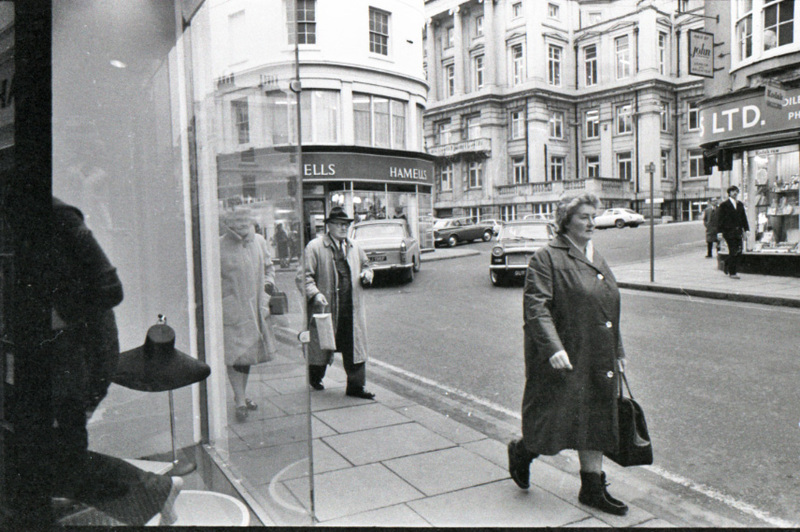 Others have probably identified the locations but left to right they are: (1) The eastern side of East Street at the junction with Bartholomews, where a lot of high end ladies fashion shops congregated togther selling twin sets and of course fashionable hats, one of which can be seen in the shop window. (2) The Western Road side of Churchill Square where some rather less elevated types like me hung around trying to meet girls. 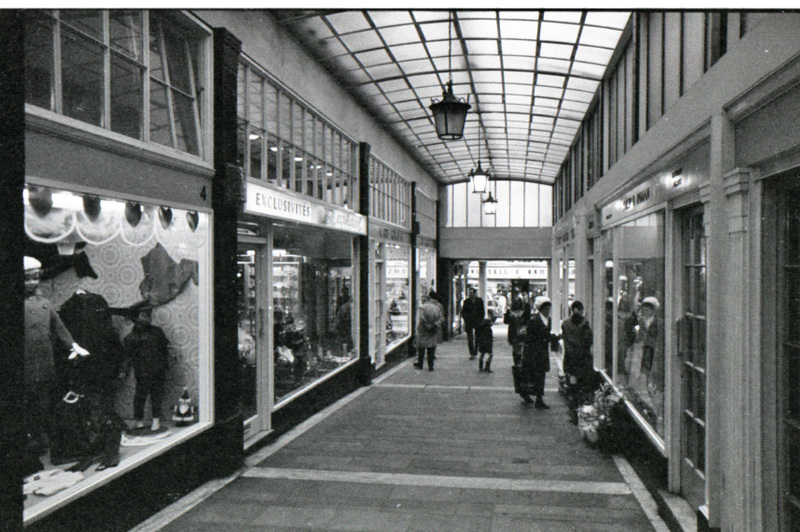 And (3) and (4) the decidedly posh T – shaped Regent’s Arcade, the first view looking down towards East Street (there was and still is a slight slope) and the second inside, maybe taken from the same place but turned 45 degrees to one side. I often expected to be be turned out by uniformed beadles here but of course in those days there were hardly any security guards let alone beadles (I used to read a lot of Dickens). 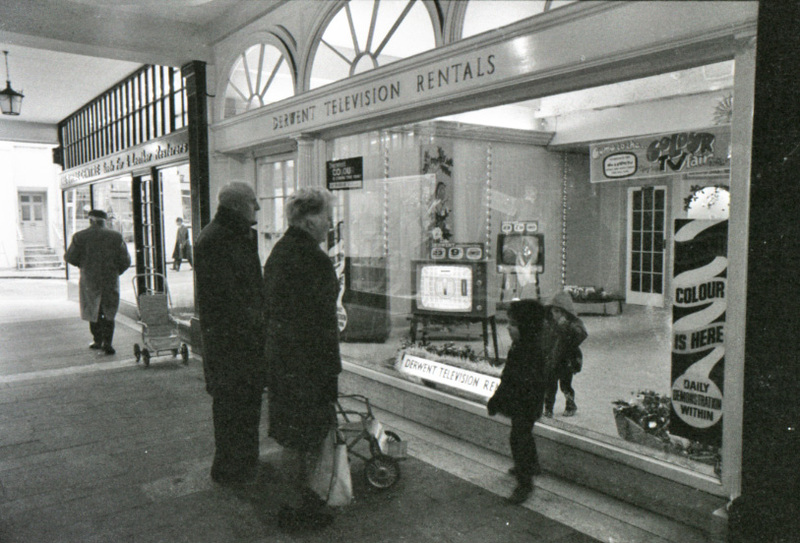 Derwent was an upmarket TV rental and sales place and colour TVs cost much more than B&W so Regent’s Arcade was their natural location. Last time I was back in Brighton, East Street and the arcade still had top end shops, although totally different ones, but the Churchill Square view was unrecognisable. Yes certainly it’s East Street. I lived just round the corner in Nile Street. There were a lot of top end ladies fashion shops on both sides of the street at this point. I think the shop on the immediate left of the picture was called Milvertons. My sister and I had several matching party ‘outfits’ from there to wear on Christmas Days and Easter Sundays in the 60s. Tucked away at the back of Churchill Square the Whitgift Card Centre, the biggest card shop in the area (in Europe at the time), was owned by Mr and Mrs Blagden. I used to be a rep calling on them with a range of cards to sell. Danny – that brutalist concrete statue was called the ‘Spirit of Brighton’ – there are some images somewhere if you google it. I remember it well – looked especially sad and ugly as the old Churchill Square emptied out prior to redevelopment. I guess it was just smashed up? I remember the young Geoff Mead whilst I was working as a Saturday boy at Sainsburys circa 1973/6. I collected the trolleys from around Churchill Square and met my mates whilst they skateboarded around the Square and car parks. I’d always get the Albion result (they were in their heyday) from the TV shops and Geoff and the other junior managers would grab me to get the result – no mobiles, Blackberries in those days. The store manager never smiled in my time there. Renia is right. This is definitely the west side entrance to Churchill Square. At some point Tesco’s must have moved from here to its final location at the back. In this photo you can see the side entrance to WHS Smiths. A few of us spent many hours last night debating this photograph and all finally came to the same agreement. Mothercare was in the Tesco’s spot during the 80s. But Tesco was on two levels at the rear of Churchill Square, so isn’t that just the upper level that’s visible? Renia Simmonds is absolutely right. Lee Ambler and Paul Simpson have misunderstood the layout and the different time periods. BHS was not behind the taker of the photo, it would not be visible, The sign for WHSmiths is the side entrance to BHS, if the photographer took several paces back, and looked to the left BHS would be several shops along. The Tesco shop later moved to the back of the shopping centre, the Tesco in this picture later became Mothercare. There is only ONE level here, there are two levels at the back of the shopping centre, so the man with the bag is nowhere near those steps. However, there were a few places where there were stairways down into the underground carpark, the only detail I am not certain of is the exact location of these (I was a child at the time so I didn’t have a car, but I sometimes went down these stairways to have a look whilst waiting for my mum), the structure behind the man with the bag (with the small trees) might hide one of those stairways. And for those confused by my previous post, change: “The sign for WHSmiths is the side entrance to BHS” to: “The sign for WHSmiths is the side entrance to WHSmiths”. Now it makes sense. You can see the Town Hall in the centre of the picture but did some of the younger residents of Brighton know that it used to house the Police station up until the mid sixties? If you go along the side you can still see ‘Police Station’ on the windows. One of my favourite films from that era was ‘Jigsaw’ in 1962- it is filmed in and around the very area this picture is centred on. Anyone who’s interested should go to the tours they hold there as they take you to the original police cells, there’s a fabulous bit of graffiti on one of the cell doors saying ‘Dave the Rocker 1965’. Does anyone remember Macfisheries? it was round the corner to the left, just before the main plaza. As a very young lad, I recall it was opened by Ken Dodd. My Mother took me along. I remember he scared me, and his teeth were yellow. Amazing isn’t it, the dopey things you remember after so many years? I was working at Tescos, Churchill Square when it opened in the early seventies,71/72? I was chosen to go on the open top bus with the boss Cohen, he came around the shop and just pointed to us. We were given sashes to wear saying Miss Tesco or something similar. Does anyone have any photos/ footage of this please? I remember it well. My best memory of it was coming back from a holiday in Spain at the end of August (many years ago) and seeing Christmas cards on sale! I will never forget that. Hi Motown Mickey! Sorry, but this is most definitely the old Churchill Square (before the redevelopment in the late nineties)! On Saturdays and school holidays I used to work in Acres the Bakers which you can see next to Tesco. That was in 1970 to 1972. 100 per cent Churchill square. Also there was a W.H.Smith record shop just to the left of Tescos. Mickey, have you been spending too much time with them Brighton hippies, and smoking their weed, of course its Churchill Square Brighton. I worked for IT Office Equipment in the ’60s. I think they were in Duke Street in Brighton. We serviced and repaired typewriters and calculaters all over Sussex. I used to work in Derwent TV as a trainee TV engineer. We used to convert the black and white TVs from the old 405 lines to 625 lines. Then, with the advent of colour, had to retrain. Setting up these old TVs was a nightmare and took an hour or so to install unlike today’s flat screens. Next door in the picture was a shop that sold all leather clothing and, opposite Derwent but not in view, was Nicholas Hoogstraten’s shop called Deb Boutique. To those disputing Tesco’s food-hall/home-wares locations I believe this changed in the mid 70s. I was a student and worked part time in the clothing and home-wares part of the store and it was definitely upstairs in the last few years of the 70s. My brother worked in the food-hall downstairs. There was a perambulator installed to take trolleys between the floors alongside the escalator. The liquor department ended up in the area to the left of the escalators towards the end of my time there. There were definitely the three entrances to WHS and my first memory of downstairs was that it was always hot. Also in that same area was a Mothercare. Does anyone remember Keymarkets in London road? I worked there for a while after leaving Bellmans. The manager was a Mr. Blake and the under manager Mr. Richard Evison. Does anyone remember them, or anyone else who worked there? My name was Maureen Friday nee Muzzall from Hervey Road. Yes this is certainly the old Churchill Square I remember when going shopping with my dad in the mid 80’s. We used to go for something to eat in Sarah’s first, then Bejams then Tesco. And would you believe it one of my early jobs was in Sarah’s but I only did it for a few months.